When the Sun is high, the probability of seeing an eclipse depends only on the proportion of the sky which is covered by cloud, a factor which is represented by the mean cloudiness of a site. As the altitude of the Sun declines however, the depth of the cloud becomes more important as a restriction to visibility. This is easily understood by considering the effects of a towering thunderstorm Ð if overhead, the blocking capacity depends on the area of the base of the storm. If the thunderstorm is on the horizon, the blocking effect depends on the width of the storm perpendicular to the line of sight and its height. If the average height of clouds in an area and the mean cloud amount are known, then the probability of seeing the eclipse can be calculated for a given solar altitude. Such a calculation is shown in Figure 23, using climatological values for these parameters. Adjustments are made for the time of day, since a large part of the cloud cover along the track is convective in nature, and thus dependent on the hour. As with any calculation, the results of Figure 23 should be used cautiously. The climatological data used in the modeling are smoothed out from their true values, and small scale variations are lost or muted. 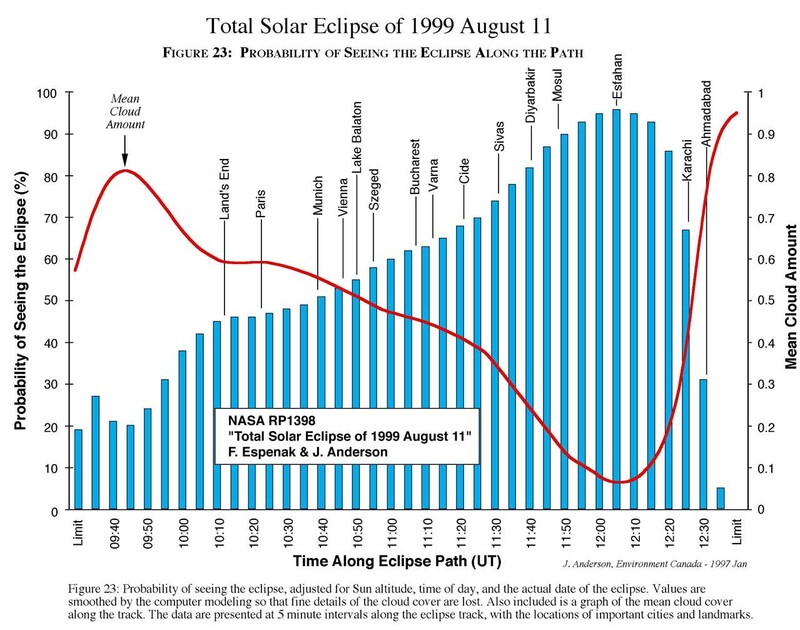 Actual forecasts on and ahead of eclipse day will provide much more information than this figure, though of course they do not permit planning years ahead of time.